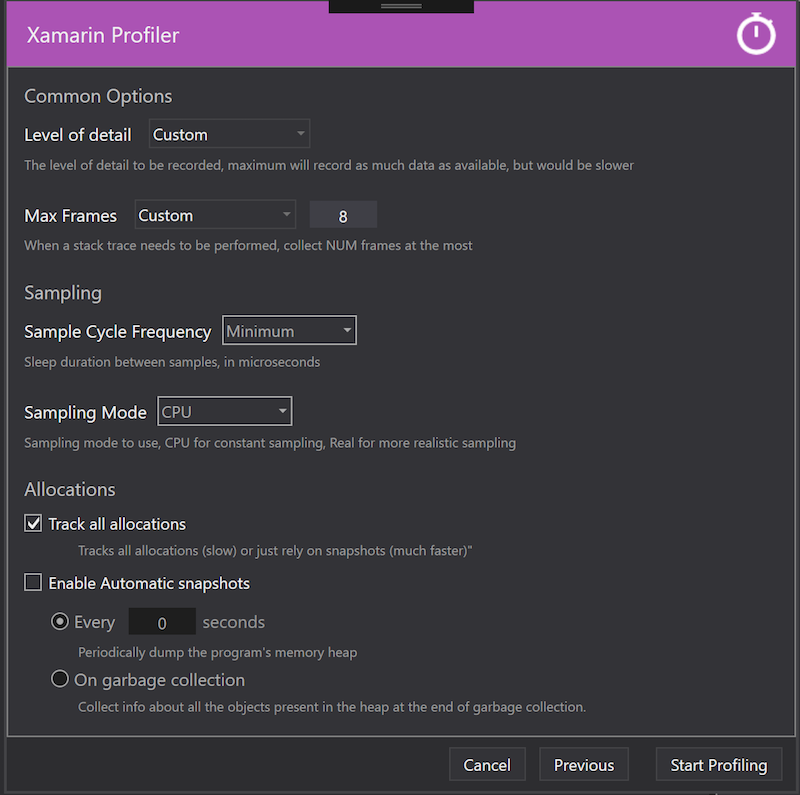 This is a beta of the upcoming Xamarin Profiler 1.6.3 release. These previews are unsupported builds to allow developers to test the new features, and to gather feedback and bug reports. Your help is very appreciated! Fix crash when connection to Android devices fails. Fix misplaced per-threads charts on Windows UI. 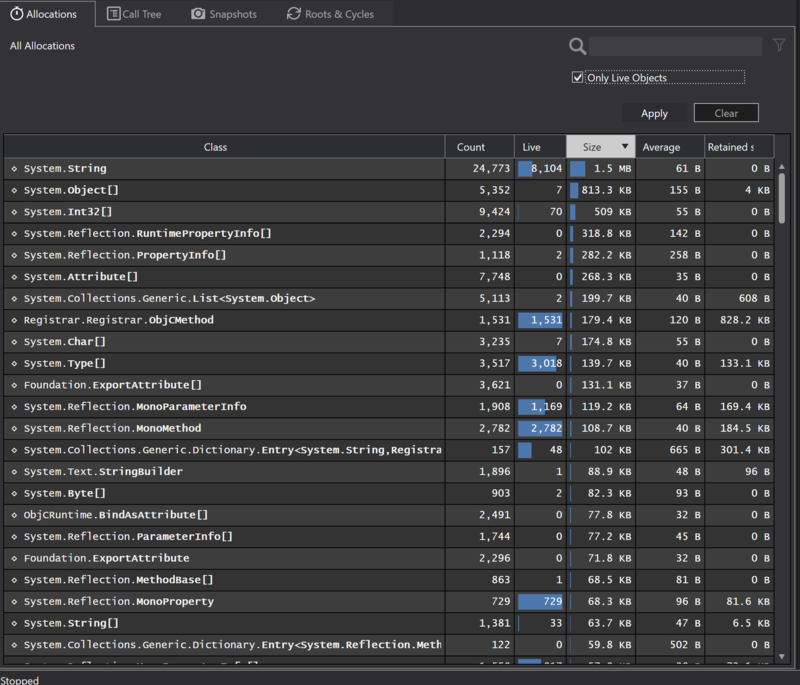 Use new Mono profiler arguments. This allows for a much better light allocations mode, as the new arguments allow much more detailed specification of what needs to be disabled/enabled when profiling. Fix misleading text in main charts' tooltips. Display more detailed GC-related information stats for Snapshots. Continuing on the improvements for the light mode introduced in previous releases, the New Session dialog now provides an easy to use UI to select what level of detail the user wants when profiling. 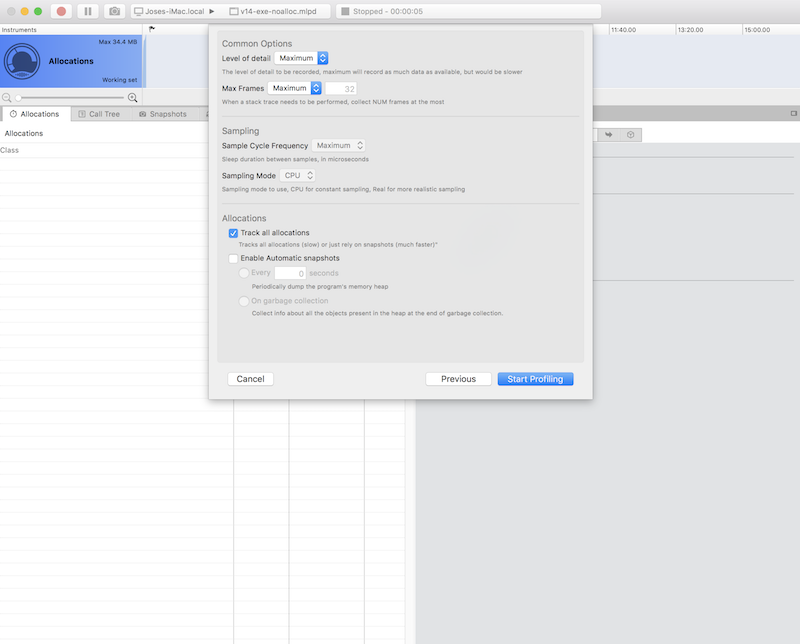 This greatly simplifies the dialog, as it is clearer what settings are used for every mode, while, at the same time, customization of all the values is still possible. There were several ways to filter the displayed data (search box, options in right side panel, etc), each of which was firing a query to the underlying data, which resulted in useless CPU and memory usage when more than one filtering option was needed, as well as a not-so-good UX, as options were scattered around different parts of the UI. This is the beginning of a much better filtering/querying UI/UX, which will allow users to easily query the data being displayed without having to, first, use unneeded resources (i.e., fire several queries against the data when just one refresh is needed), and 2nd, query the data in much better ways to help diagnosing problems much easier. Up till now, Profiler just remembered the last 10 "desktop" files (.app, .exe on Mac, and .mlpd's on both Mac and Windows) you had opened, but didn't remember the last iOS/Android apps you had profiled. Not anymore, now the last 10 targets, whatever they are, are remembered, so it's easier to launch a profiling session against your day-to-day applications without having to launch the IDEs. Of course, this would only work if the app being profiled (in the case of iOS and/or Android) has already been deployed to the device/simulator and the device/simulator is attached to your machine. But it should help a lot in profiling the same app over and over in a much faster way, as no IDE intervention is needed. 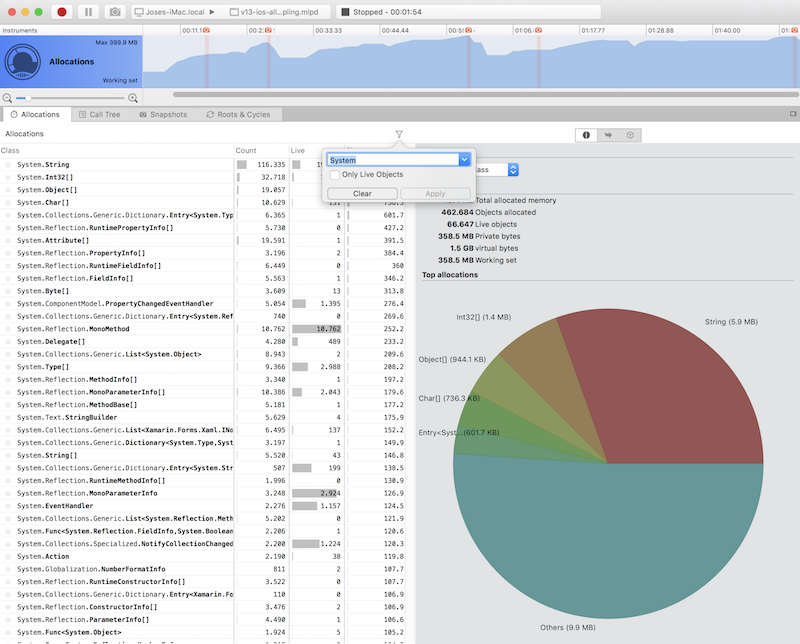 While having a UI for profiling your apps is great, we have made publicly available now an internal tool we had for profiling our code in an automated way (in CI/CD): Xamarin.Profiler.Console.exe. This is basically just a console version of the Xamarin Profiler, which you can easily use to automate profiling in your CI builds. It profiles the app and generates a report (in JSON) which you can easily store somewhere (i.e. on a Database) and, from it, generate some sort of reporting to see how the performance of your application degrades or improves over time. This small tool has already helped the Xamarin Profiler in finding several problems, so we hope it will do the same for external users. It is though the 1st version we make available, so please let the team know of any problems you might encounter as well as any suggestion for making it suit your needs.